FINAL SALE. A bow on the side of this classic strapless dress gives it a girly and whimsical touch. The Bow With Me Strapless Dress has a strapless sweetheart neckline and lined and lightly padded bust. The top part is made of a textured fabric. The attached skirt is made of a fluid fabric and is unlined. It has a crossover wrap skirt and a fabric bow at the waist. The Bow With Me Strapless Dress would look nice paired with pumps or strappy heels and a clutch. This is a cute dress to wear on date night or out with friends. 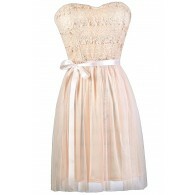 This is a really cute party dress with girly details. 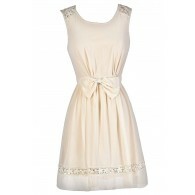 You have added Bow With Me Strapless Dress in Ivory into Wishlist. You have added Bow With Me Strapless Dress in Ivory for Stock Notification. 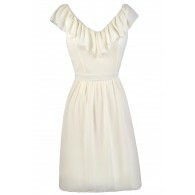 You have set Bow With Me Strapless Dress in Ivory as a loved product. You have removed Bow With Me Strapless Dress in Ivory as a loved product.